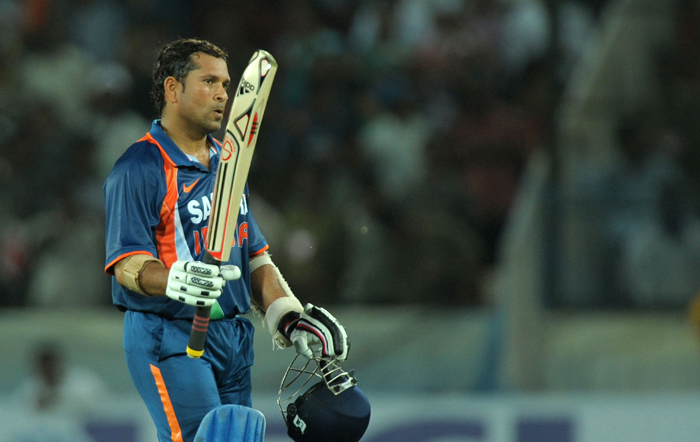 Master Blaster Sachin Tendulkar has become the first batsman to slam 47 hundreds in the One-Day Internationals. We take a quick look at the centuries he has scored so far in his career. 47th Century: After failing to score in the World Cup opening match against Bangladesh, Sachin Tendulkar brought up his 47th ODI hundred in style against England in Bangalore. He hit four sixes and eight fours in his 103-ball century. He made 120 off 115 balls before England pacer James Anderson dismissed him. 46 Century: Sachin Tendulkar became the first batsman ever to score 200 runs in the history of the 50-over game. With this knock, Sachin broke the record of the highest One-Day International score of 194 runs held jointly by Pakistan's Saeed Anwar and Zimbabwe's Charles Coventry during his knock of 46th ODI hundred. 45th Century: It seemed like an impossible task. India were chasing 351 runs for victory in the 5th match of the ongoing India-Australia series. The middle order crumpled, Sachin stayed on. Probably the most exciting run chase of the year, Saching kept scoring all around the ground. Maximising advantage of an injury hit Aussie bowling attack, Sachin kept hopes of a billion Indians alive by leading India very close to a victory. But the tables immediately turned when Sachin was caught at Short Fine Leg at a score of 175 runs. With the fall of Sachin, fell the hopes of an entire nation, and the mesmerising run chase fell short by just 3 runs. 44th Century: On September 14, 2009, Sachin wisely held the Indian innings together and scored 138 runs against the Lankans, at the Premadasa stadium in Colombo to lead India to victory. 43rd Century: If anybody knows how to do it in style, it has to be Sachin Tendulkar. Waiting a full year after his 42nd century, Sachin impressed everybody with an unbeaten 163 against New Zealand on March 6, 2009 at AMI Stadium, Christchurch. Announcement made, Sachin is back. Anil says: Simply Incredible . he is showing us real sporting blockbusters with his magical knocks for 20 yrs.Lot of things to learn from him. thanks for feeling us proud.